WASHINGTON — Democrats on the House Judiciary Committee said on Tuesday that they have retained two elite white collar litigators and prominent legal critics of President Trump to help begin inquiries into some of the most sensitive allegations involving the president, including ethics violations, corruption and possible obstruction of justice. The committee’s chairman, Representative Jerrold Nadler of New York, has not committed to opening a formal impeachment inquiry, but the addition of the two lawyers, Norman L. Eisen and Barry H. Berke, indicates that the Democrats do not intend to wait for the special counsel, Robert S. Mueller III, to finish his work to begin weighing issues that could ultimately be wrapped up in such a proceeding. Mr. Nadler gave little detail about those inquiries in his statement, saying that Mr. Eisen and Mr. Berke would consult on matters “related to the Department of Justice, including the Department’s review of Special Counsel Mueller’s investigation.” A Judiciary committee official, who was not authorized to discuss the appointments publicly, said that Democrats would be rolling out more detailed plans in the coming weeks. Mr. Eisen and Mr. Berke are arguably the highest-profile legal hires yet by House Democrats as they prepare for those inquiries and others. Mr. Eisen, 58, served as the top White House ethics lawyer under President Barack Obama and later as his ambassador to the Czech Republic. A former white collar litigator and investigator, he has emerged since Mr. Trump’s election as one of the president’s most recognizable legal critics, using his perch as chairman of Citizens for Responsibility and Ethics in Washington to write voluminously about what he has argued are ethical lapses and instances of outright corruption in his administration. Mr. Eisen also serves as a co-counsel in a lawsuit accusing Mr. Trump of violating the emoluments clause of the Constitution by refusing to divorce himself from his businesses. Mr. Berke, a partner at the New York firm Kramer Levin Naftalis & Frankel, is less well known in Washington, but has written voluminously with Mr. Eisen about obstruction of justice and the president’s other legal vulnerabilities. He has extensive experience with complicated financial and tax crimes cases. As House committees launch an array of new inquiries into Mr. Trump, his administration and his businesses, the Judiciary Committee is likely to emerge as a crucial arbiter of Mr. Trump’s political fortunes. It has oversight of the Justice Department and F.B.I. and traditionally has been the venue where impeachment proceedings begin. 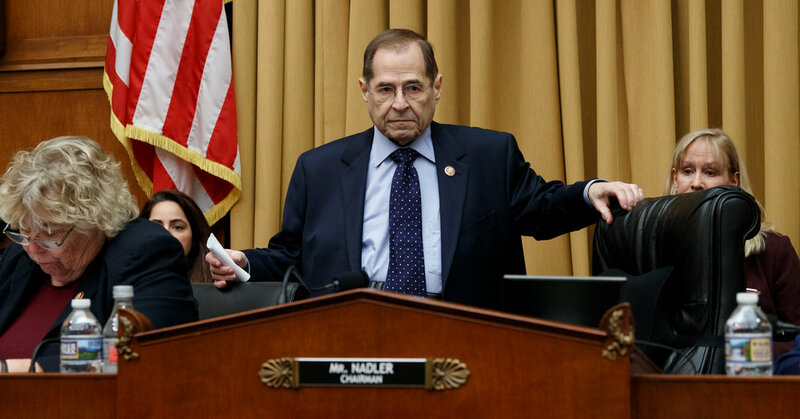 Despite considerable pressure from his left flank, Mr. Nadler has thus far approached the impeachment question cautiously, saying repeatedly that he does not yet see a case and wants to wait for Mr. Mueller to finish his work before proceeding to any formal deliberations. But he has made some of his views clear. In recent weeks, Mr. Nadler has said publicly that he believes Mr. Trump “has engaged in a long pattern of obstruction” and views his attacks on federal law enforcement as an existential threat to those institutions. He has said in the past that he also plans to investigate Mr. Trump’s role in making hush money payments shortly before Election Day in 2016 to two women who said they had affairs with Mr. Trump. The president’s former personal lawyer, Michael D. Cohen, implicated Mr. Trump in those payments in court last year as he pleaded guilty to a campaign finance violation and others. Mr. Eisen and Mr. Berke, together with Noah Bookbinder, the executive director of C.R.E.W., have written a series of reports on obstruction of justice, collusion and Mr. Trump for the Brookings Institution. “In many ways, the question has become less about whether there is a case that Donald J. Trump obstructed justice, and more about whether and in what form the rule of law will be followed,” they wrote in one last August.